Retired music producer Oliver Smallman had no intention of building a passive house when he approached the London architect Richard Dudzicki for help designing a house. Smallman had simply seen pictures of Dudzicki’s own self-designed house in London’s Evening Standard, and was drawn to its modern eco-friendly aesthetic. 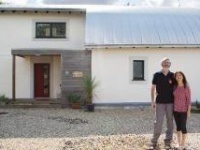 Smallman and his wife Holly intend to move into the £450,000 ‘Chiswick Eco Lodge’ at a later date, but for now they are renting it to the Nashville singer-songwriter Ed Pettersen and his wife. Pettersen specifically wanted to rent a passive house in London, and chose it before moving over from the US. But when he arrived, there was an unexpected bonus. The central living space possessed such extraordinary acoustic properties that Pettersen decided to install a full recording studio complete with 20 guitars. 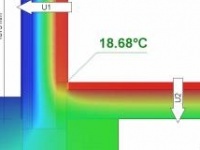 It turned out that the materials used to create the passive house worked equally well for sound quality. Planning regulations also stipulated that the concrete core had to be covered in London stock bricks to blend into the environment. Dudzicki used brick slips that are purely decorative to appease local anxieties. “We’ve got blue engineering brick slips below ground and above ground we’ve got the London stock, which looks lovely. Then the top part of the building disappears with the living walls around it. Six months after we installed it, it’s growing and developing nicely,” he said. 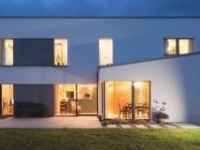 The house – a Gold Award winner at the 2015 London Design Awards and finalist in the urban category at this year’s Passivhaus Awards – was completed in September 2015, but has only been lived in for a short time. 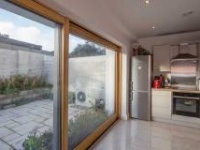 Judging by the first two months of bills, the Chiswick Eco Lodge is living up to its name. The tariff was just £15 for electricity and £20 for gas for one month between April and May. At the outset, there were two major challenges. There was a tree at the front of the house and its roots had to be avoided. And the design had to guarantee enough light on the south-facing side. Dudzicki managed to solve these issues and Smallman approved the designs, which had two bedrooms in the basement, an open-plan living and kitchen area on the ground floor and a smaller top floor containing a study, or third bedroom. The intention was to build the house as a kit, using imported panels, but the site’s geology scuppered this idea. Soil investigations revealed that sheet piling would not work through the riverbed shales and Dudzicki had to opt for corkscrew piles with some underpinning of the existing house on the site. The insulation process was not straightforward, however. The ‘tea cosy’ could be wrapped around the outside of the building for the two storeys above ground, but that approach did not work for the basement. “You have to step in on the ground floor so the insulating tea cosy runs from the outside to the inside of the building,” he said. There were also unexpected technical challenges such as when Dudzicki turned up on site one day to discover there were problems with the beam-and-block system installed in the basement. Normally, the beams would go on hangars on outer walls and there would have been an airtight seal, but they were driven straight into the walls. “They had oversized the beams and put them straight into the walls, leaving T-shapes all around. The question was how do we make it airtight?” So the gaps around the beams were filled in, while the main airtightness layer was formed by plastering the walls to the outside. Air tests showed that the building was functioning well. Before the windows went in, it had to pass a test showing less than 0.6 air changes per hour. The team taped up the window spaces with airtight sheeting and performed the test, which went fine. The next tests came after the Internorm windows were installed. “We had to be careful putting in airtight tapes. They had to be bunny-eared, meaning pinched not cut around the corners. The builders had not done it before but they managed it,” he said. Again the building passed the air pressure tests. The focal point of the house is the central concrete staircase. All the floors are suspended from this core, rather like in a skyscraper. The plentiful use of concrete also presented aesthetic possibilities. The concrete in the staircase was adorned with wooden shuttering. “When the wooden shutters came off the internal concrete, some of it peeled off but we left it, so we had rough next to smooth, creating almost a sculptural effect,” he said. Parts of the walls in the living room on the ground floor were concrete, too, but the designers used polished metal shuttering here. The central living space possessed such extraordinary acoustic properties that Pettersen – a singer-songwriter – decided to install a full recording studio. Getting enough light into the rooms was a priority for Smallman in the confined urban space, and several solutions were found. In the open-plan living space, a large roof-window above the entrance hall brings in light and on the top floor, which has smaller windows to minimise the impact on neighbouring properties, there are two skylights. Even in the basement, the two bedrooms open onto private courtyards and a bridge link connects them to a private sunken courtyard garden at the back of the house. “It’s all interlinked and was complex to design, but it works well,” said Smallman. Dudzicki worked with landscape designer James Lee to provide overshading in the summer months. “We’ve not added any solar blinds, but we’ve allowed some plants to grow deciduously to allow shading at the back of the garden,” he said. Smallman is delighted with the results. “I have an aversion to dark houses but it’s flooded with light and looks really beautiful,” he said. Green materials: External living wall, sedum naturally grown roof.